Specification or BOM (Bill of Materials) generation is one of the most tiring, but inseparable parts of the furniture design process. Also, this is where human factor mistakes have a great chance to sneak in and cause costly mistakes. In order to solve this issue Woodwork for Inventor uses its own specification generator. What is special about it? Woodwork for Inventor specification generator allows generating BOM automatically according to the designed 3D model. 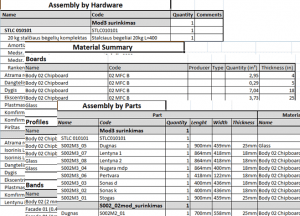 The generated Bill of Materials includes all information needed for production – product structure, a summary of materials and purchased components, cutting list, general list of parts, etc. The whole information is derived to tables in MS Excel file. MS Excel file can be easily used in various production and business chains. For example, it can be used for data transfer to the part cutting optimization program or submit specification to order materials. Moreover, the generated specification is not static. It‘s easily changeable and adaptable to company needs. All that user needs to do is make changes in the content of BOM template which is saved as MS Excel file. It gets even better. 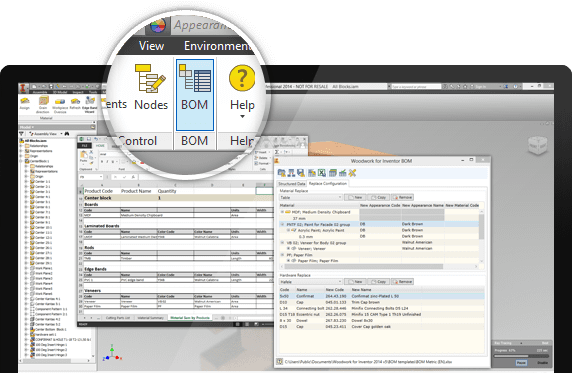 When a user has a BOM on his hands he can easily merge data in his specification with the data stored in other systems. All he has to do is to change the names of the items in the specification to the names in other systems. Woodwork for Inventor memorize those changes. For example, this way it is easy to change Woodwork for Inventor material codes to codes stored in the ERP system. Woodwork for Inventor Bill of Materials can be saved in its own file format. It facilitates when a large order is formed because these files can be merged into one file. This way user doesn‘t have to merge products in Autodesk Inventor environment. 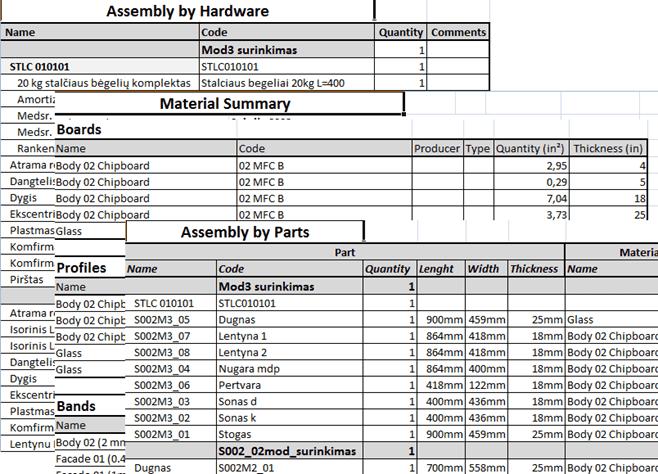 Woodwork for Inventor BOM files supports well readable XML format. Therefore, if necessary, it is easy to create program tools that would read this file and to transfer its content to other systems. For example, the ERP system can use these files and automatically enter the product data for further use of information in production and business management. Woodwork for Inventor specification generator (BOM) now contains new important keywords which allow providing more comprehensive information about the product. Firstly, a user can export the product numbering executed in Autodesk Inventor specification to Woodwork for Inventor BOM. This way the numbers of drawing positions can be configured in Woodwork for Inventor specification as well. Secondly, new keywords have been added allowing you to integrate information about CNC machining into the reports generated by Woodwork for Inventor. This is important when organizing information for part labels. Lastly, now there are keywords available, which allow indicating the parent component node. This can facilitate navigation through part drawings when tracking to which assembly, the part represented in the drawing, has been included in. Instruction of how to work with a specification.